Avast ye! 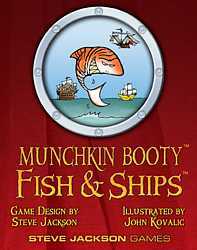 Fish & Ships be full of Sharks (and other denizens of th' deep) and Ships for yer Munchkin Booty game! We gots here Fish rangin' from yer pathetic Fish in a Barrel to yer munchkin-mangling Tiger Shark. We gots six new Ships, and all of them be good and most of them be really dumb. We thinks that Jet Ski be the dumbest, but there be room fer argument here. And ye can give any ship a Glass Bottom, ta see what's comin' at ye, or Clockwork Wings ta rise above it all. This be a supplement, not a stand-alone game. Fish & Ships be neither collectible nor randomized; every pack be the same as every other. Arrrr.